Get autographs from the special guests at their booths! Have your photo taken with the Game Of Thrones stars and printed for you on the spot. €15 per photo. Have your photo taken with Maul Cosplay and printed for you on the spot. Photos are FREE! Have your photo taken with Star Wars’ C3P0 and printed for you on the spot. €40 per photo. Our very best cosplayers will create a show full of music, lights and performance acts. Watch them receive live feedback by our professional cosplayer judges. 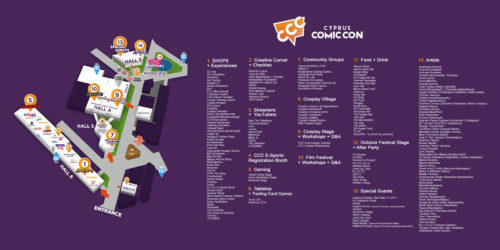 The winner gets to represent Cyprus at the international EuroCosplay Championship Final in London! Our selection of the best short films submitted by the local and global communities. Cosplayers can take free professional studio photos to commemorate their costumes! Have your photo taken with these talented cosplayers and printed for you on the spot. Photos are FREE! Watch the judging session live! This on-stage cosplay parade features every cosplayer at the convention! All Cosplayers are welcome to participate, both contestants or not! At the end of the parade, the awards for the Masquerade will be announced!